After hoping up off the bus I walked alongside the road for a few minutes until I saw a small path leading down. I took it and found myself staring at a group of six or seven children around a huge steaming cauldron. They peered at me cautiously, and the youngest ones even ran away. I stayed where I was, not sure if I should approach even though I was curious as to what they were making. A few minutes later a women, followed by a pigtailed eight year old girl, came up behind me and laughingly invited me down. Though many of the children stayed away, obviously still frightened by me, the women asked me where I was going. Pretty soon a man approached, her husband, and handed me a warm thick heap of brown sugar on a leaf. Sweet and flavorful, unlike any sugar I have tasted in the west, I realized the huge steaming pot in front of me was filled with sugar cane syrup they were transforming into sugar. The children who had scattered when I arrived moved cautiously closer, watching me atop the large piles of sugar cane peelings that were surrounding us all. During the next hour people would come and go, and each time someone new arrived, they would run quickly across to the other side, unsure what to think of me. Once the next batch of sugar was ready and still mailable like dough the man called the children over, and though they were still wary, the temptation of sugar was too strong. They approached, hands outstretched with leaves, to receive their small lumps while glancing and giggling at me. A few of the girls finally sat on the rocks close to me, watching me and smiling but turning away whenever I caught their eye. The last enormous pot of sugar was finished, so the children took advantage of their free time to commence an amusing game. There were two teams, and while one team had control of the ball, a mound of material someone had stuffed, other team would try and stack ten rocks up before their team was all hit. I watched happily from the side, laughing as the boys did some crazy dives to avoid getting out. Pretty soon I had a few of the girls next to me, and the bravest was asking me questions. I knew I would win them over eventually! When I asked to pitch my tent in the open field next to where they had been cooking the sugar, the couple invited me into their house instead. I proceeded up to a small mud hut filled with smoke where I would be spending the next three nights. 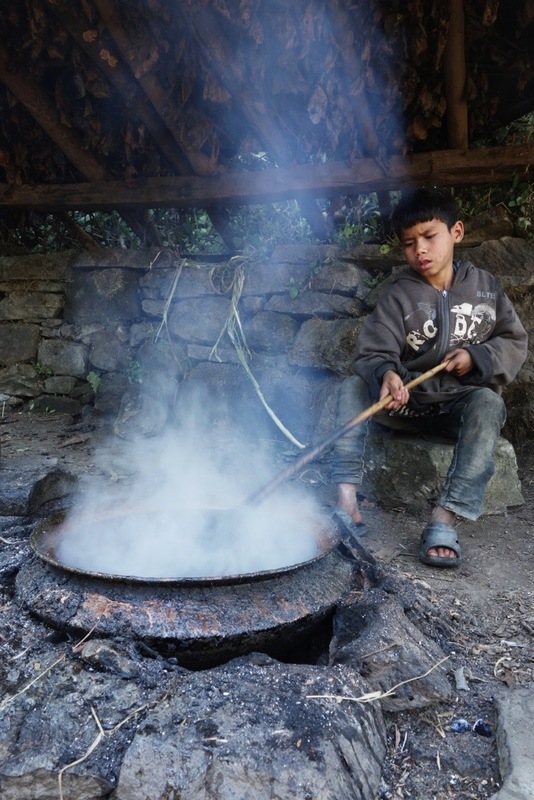 This entry was posted in Nepal and tagged far western nepal, how to make sugar, Nepal sugar, Nepal sugar cane, Sugar by The Wandering Nomads. Bookmark the permalink. What a fantastic blog, and your pictures are absolutely incredible. Hats off.